Godfrey, W. Earl. "Jaeger". The Canadian Encyclopedia, 04 March 2015, Historica Canada. 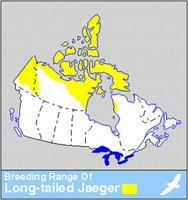 https://www.thecanadianencyclopedia.ca/en/article/jaeger. Accessed 24 April 2019. The Jaeger is any of 3 species of rapacious, gull-like seabirds of genus Stercorarius. Jaegers mercilessly harass other birds, forcing them to disgorge food that the jaeger then snaps up with a graceful swoop (artwork by Claire Tremblay). The Jaeger is any of 3 species of rapacious, gull-like seabirds of genus Stercorarius. 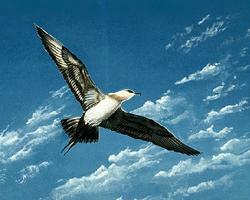 With their close relatives the skuas (Catharacta), they are placed by some taxonomists in the gull family (Laridae), or in a family of their own, Stercorariidae. 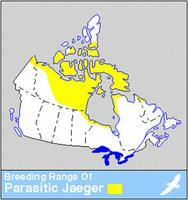 Jaegers are hook-billed, long-winged, swift and predatory. They mercilessly harass other birds, forcing them to disgorge food which the jaeger then snaps up with a graceful swoop. 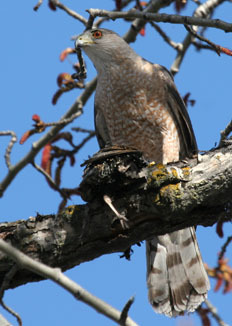 They are polymorphic and adults have elongated central tail feathers. 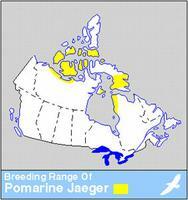 Breeding range is northern circumpolar. All 3 species, pomarine (S. pomarinus), parasitic (S. parasiticus) and long-tailed (S. longicaudus), nest widely on the arctic tundra where they feed on small mammals, birds, fishes and invertebrates. 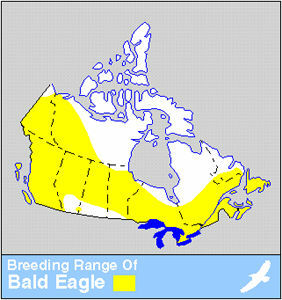 Because they winter on the open oceans, they are scarce in the southern interior of Canada at any time.